it all started with joseph william morgan. who sounds like an average white male, but is really the combined alter ego of two musicians previously best known for divided by friday. the duo currently churns out epic orchestral soundtrack pieces, even though their past lives revolved around the pop punk/emo persuasion. unexpected and weird (though not quite as shocking as the time a pop punk band gained a country-esque twang ahem boys like girls), but also really cool. pair that with the hubbub around side hustles, and i got to thinking about how i want to know others as deep, complex people even though i sometimes see only the shallow bits. and how i want to be seen as a multi-dimensional person with different interests. 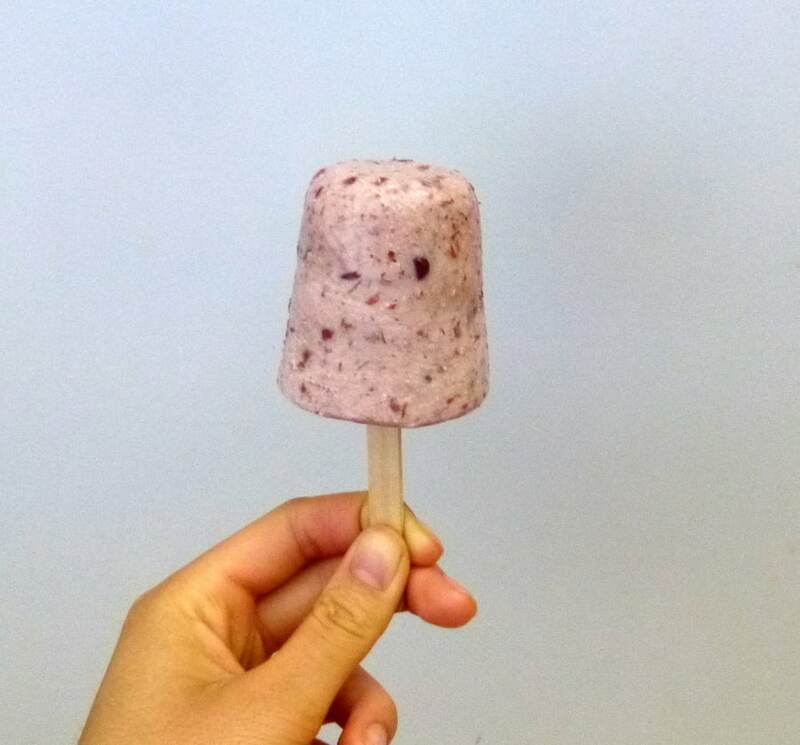 someone who’s both creative and logical, someone who likes cake, but can also get jiggy with this summer fruit and tofu coconut forbidden rice. it’s kind of decadent from the coconut milk-rich rice. which isn’t my typical brown/white rice mix, since there’s some black forbidden rice for good measure. it’s nutty and toasty and chewy and the cooked rice emerges from the rice cooker depths a gorgeous inky purple. tbh, i can imagine calling it a day with this coconut rice and topping it with fruit for snack or dessert in the manner of a rice pudding or thai mango sticky rice. 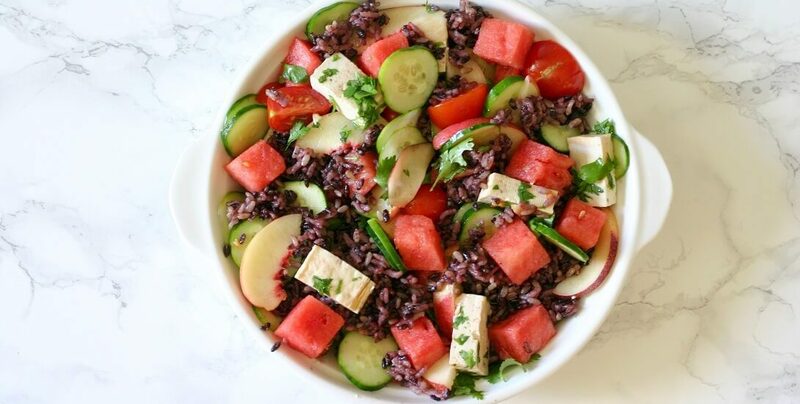 aside from all that swoon worthy rice, the cucumber and watermelon keep it crunchy, and the tomato and cilantro keep it fresh. pretty solid for a summer meal when you don’t want to cook much and your brain feels melty! 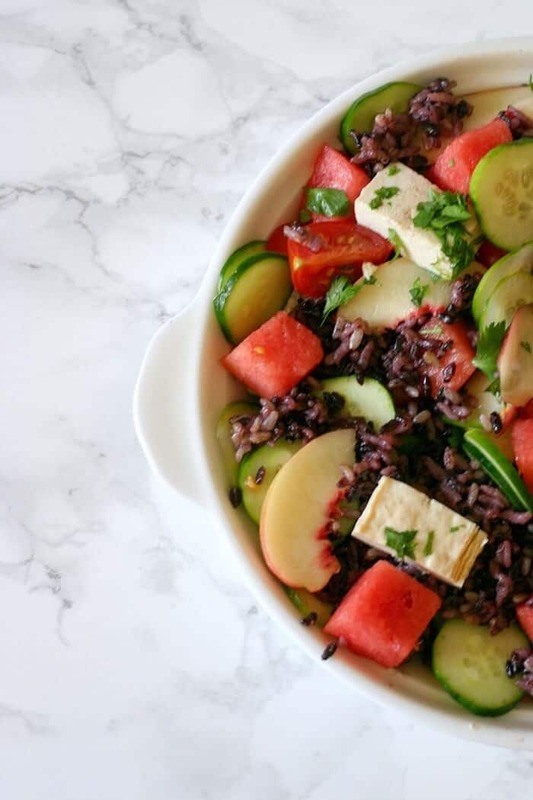 This summer fruit and tofu coconut forbidden rice is the perfect summer rice salad dish. Cook the rice with the coconut milk. I like doing this in a rice cooker, but stovetop works too. Drain the tofu on paper towels if you have time. Drizzle it with the soy sauce, fish sauce and rice wine vinegar, then toss to combine. Mix the fruit, rice, cilantro, oil, lime juice and zest in a large bowl. Top with the tofu and coconut. Season to taste with more soy sauce, fish sauce, rice wine vinegar and/or sesame oil. From Suzanne Lehrer via Serious Eats. This can be made ahead, though I'd recommend adding the stone fruit and toasted coconut right before serving. Instead of using light coconut milk, you could do half full fat coconut milk, and cut it with water or low fat milk of any kind. This dish is making me believe that there can be more uses of the delicious coconut rice other than the Thai mother of all dishes! Yumm..
Amazing medley of flavors in this one Heather!! And I love that it’s a complete meal in itself! Ooooh, these flavors sound so wonderful, together! I love Black forbidden rice, thanks for the recipe! 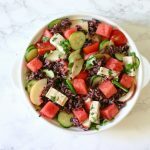 I’m not a fan of fruit in savoury dishes but love the idea of a salad with forbidden rice in it for that change of flavour and texture. My brain is definitely melty these days and something easy and delicious like this is all I need! I don’t know if I’ve ever used forbidden rice!!! I’m totally intrigued now! So many delicious flavours in this one and such a healthy, filling meal! Love that you cooked the rice with coconut milk; so good! oohhh forbidden! That means it must be good! 😀 What a great idea incorporating it into your lovely dish! YUM! Great combination of flavor and texture out here! RICE AND FRUIT ANDDDDD tofu?! Oh my lord – this is BLASTING with flavors!!! This dish is just so full of gorgeous flavors! And alllll those colors–now I’m totally craving it! This forbidden rice looks super tasty, I have yet to make it but I’ve had it and it’s always a hit. I love feta cheese, especially when you add summer fruit. I bet the addition of coconut milk adds a unique flavor. This is RIGHT up my alley! Sounds so good.. and unique! Whoa, this looks awesome. Forbidden rice is so nutty and flavorful. I bet it would be amazing with these other ingredients. Great ingredients don’t need much to shine!! YUM, this reminds me of the types of food I enjoyed when I was in bali. Looks delicious and nourishing! I’m so interested in all the textures in this salad, it’s deep and complex! This looks delicious, and I like you want to be seen as a multi-demensional person who likes cake and fruit. Who can be carefree and have a complex convo ect. There really is so much to people then meets the eye or that we can grasp from the surface! thanks! it goes both ways, though, and sometimes it’s easy for me to forget that others are just as multi-dimensional and worthy as being seen as such. I am loving the fruit in this dish and the rice sounds amazing. Yum! This dish is truly delightful, Heather. Is there any alternative to the soy sauce? thanks, agness! tamari could work, or even salt! I get what you’re saying in being about being creative and logical. Sometimes, there is a great pressure to “specialize” in which these 2 things are thought to be unable to co-exist. 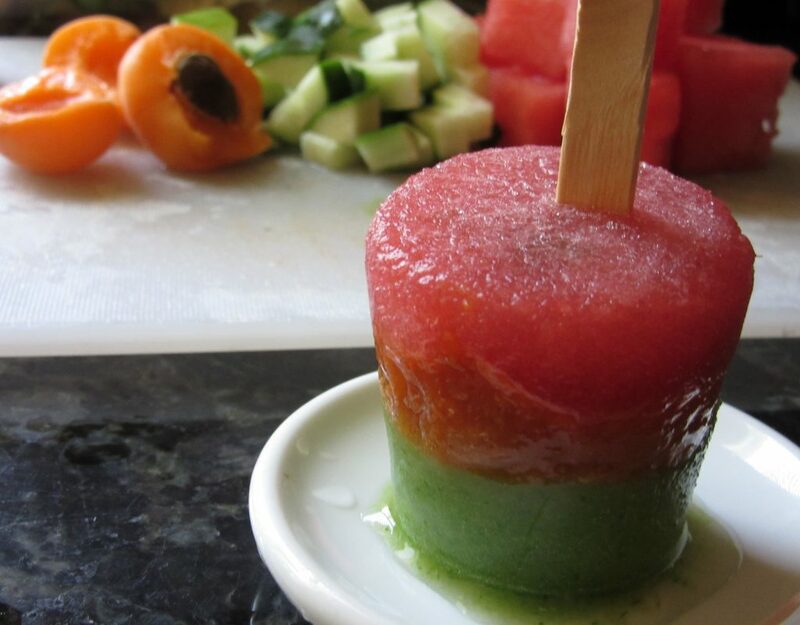 I really enjoy your writing, Heather, and your recipes! my hometown tends to emphasize logic and stem in general, so i’ve definitely seen (and sometimes felt) that pressure to pick something along those lines! OK, I just read “forbidden” and immediately knew I had to check this recipe! Haha! haha it’s that mentality of wanting what you can’t have. you can definitely sub in something else for the watermelon (and all the other summer fruit), as long as it’s crunchy and fresh and sweet. (or you could take this a completely different direction and add a bunch of roasted veggies for fall/winter! ).